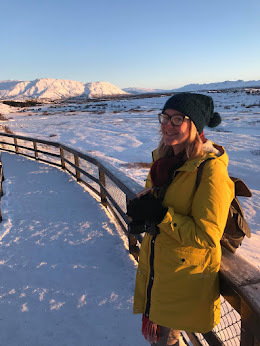 I am very excited to be involved in NICI's first ever blogging project! NICI is one of the worlds leading manufacturers of plush and gift products suitable for the whole family. NICI has only recently launched in the UK although they have been well loved internationally for over 25 years! We were sent a lovely set of goodies for review from the Jolly Logan range. Jolly Logan is a loveable sheep who is best friends with Jolly Wolf. One day Jolly Logan made himself a wolf's costume from a fluffy grey hoodie so they could stand In the moonlight and howl at the moon together. This is the story that they have based this range on. 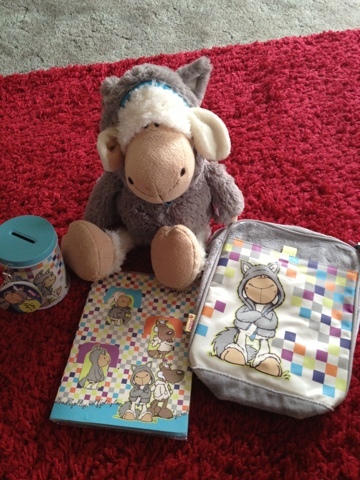 In our gift bundle we received a Jolly Logan plush, the Jolly Logan shoulderbag, Jolly Logan money box and Jolly Logan notebook with bookmarks. The adorable Jolly Logan sheep cuddly toy complete with his little wolf hooded jumper is so soft and cuddly, the perfect gift for any cuddly toy fan! It's RRP is £24.99 which is a bit steep for a soft toy unless it's for someone who collects and appreciates them. 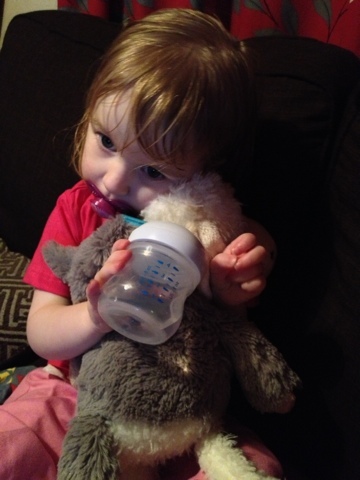 I honestly wouldn't buy for a small child like mine (all our soft toys get mucky hands all over them on a daily basis!) although since he arrived he has been much loved by Gracie and had lots of sneaky cuddles with Zach so he is definitely no waste of money if you decide to splash out. 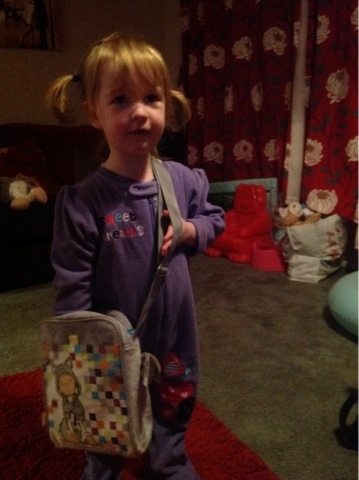 The Jolly Logan shoulderbag is as lovely and soft as the toy. This has been claimed by Gracie already as her bag she has to take it everywhere and keep her own nappies and wipes along with a few snacks inside. It is a great size for storing what you need for a day out and with a RRP of £19.99 it is definitely great value for money. The picture above should give you a rough idea of the size of the bag. 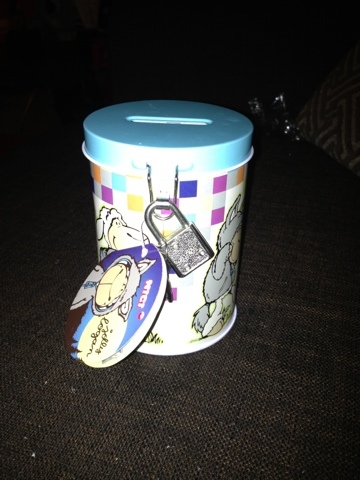 Another of Gracie's favourites from the bundle is the Jolly Logan money box, which I think is fab! We quite often use the money tins that can't be opened to save for holidays and often think its a waste throwing them away once opened but these money box's have a lock and key to make them less accessible yet reusable, all you have to do is put the key in a safe place and it's guaranteed you won't find them easily enough to remove the contents ;). Joking aside, this is definitely worth the money at a RRP of £6.99. It might sound expensive but it can be used over and over again with an easy to use lock and key facility. 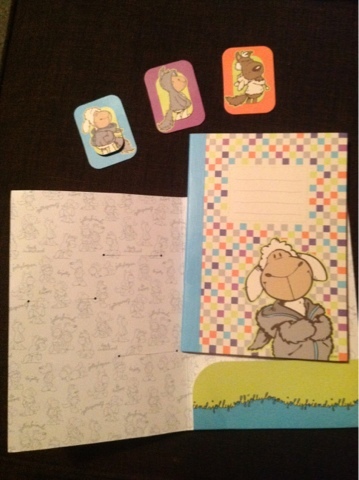 Last but not least we received a Jolly Logan notebook and bookmarks, this one has been hidden from the kids and has come in very handy for me! When I feel like I have an idea for a future post I have to write it down as my memory is not as it used to be. The notepad is a great size to stick in my bag and write when I feel inspired. Also when reviewing items I like to write as I go so I can't forget anything enabling me to write the best I can and what better way than writing in a super cute notepad. It can also come in handy for writing lists with the bookmarks making it easy to find the page you need making it perfect for anyone from mums to students. With a RRP of £3.99 this makes a great gift. I have a pretty big circle of family and friends and always love to buy quirky and cute gifts for all my loved ones and I have to say I was actually quite shocked at how lovely these gifts are, photos just don't do justice. It's a shame you can't do touch and feel on a blog as I'd love to share with everyone how lovely the cuddly toy and bag feel. Anyone that buys these products will not be disappointed at all in the quality.I will definitely be looking at NICI products for any future present buying occasions! I was sent the products featured in this post free of charge for review but all views and opinions are my own.